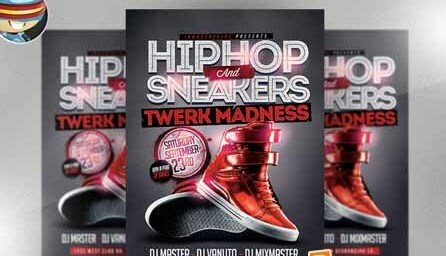 Hip Hop and Sneakers Flyer Template is a clean and modern hip hop club design by FlyerHeroes team member Hp Eskobar. Put on your freshest kicks and prepare for an extraordinary night of hip hop entertainment! General information: Hip Hop Sneakers Flyer Template is a premium Photoshop PSD flyer / poster template designed by FlyerHeroes to be used with Photoshop CS4 and higher. Once you have downloaded this template, using Adobe Photoshop CS4+ you can make use of this flyer design an unlimited number of times 100% royalty free. You are free to customise this design however you wish and use in both personal and commercial projects without ever crediting FlyerHeroes.